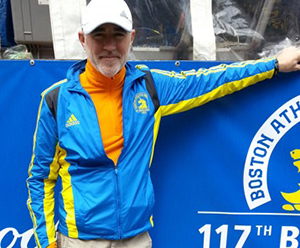 As Steve Falck ’80 grabbed his gear from a bus two blocks from the finish line, he was startled by a loud explosion. Peering past the few thousand runners and spectators between him and the location of the first bomb, Falck saw smoke billow into the air. Seconds later, another blast resounded. Just seven minutes before, Falck had crossed the finish line at the 2013 Boston Marathon. “I looked around me, and saw a police officer directing traffic,” he recalled. “He paused for a moment and looked toward the smoke, but calmly resumed what he was doing. I had no idea what had happened. I walked back to my hotel room, grabbed my stuff, and it wasn’t until I reached the airport that I knew exactly what had happened. Falck said that oftentimes when he embarks on a feat like running a marathon or a triathlon, he thinks about his mortality. Injury or suffering a heart attack could happen at any event in which he participates. Escaping serious injury or death resulting from a bombing is not one that he has ever considered, and he said his heart goes out to all that were injured when the first explosion ripped through the finish line area. “As I watched the coverage, I saw the people that I had passed earlier on the route I remembered them, and I feel so sorry for them and for what they are going through,” he added. The Boston Marathon was Falck’s fourth marathon. He has competed in several triathlons and duathlons. He graduated from Upper Iowa University in 1980 with a degree in political science, served in the Iowa House of Representatives for three terms, and is currently a senior policy advocate for the Environmental Law & Policy Center in Des Moines, Iowa. On April 15, the euphoria of crossing the finish line of the Boston Marathon turned into bloody chaos as two bombs blasted the end of the 26.2-mile trek. The blasts left more than 170 injured and three dead. A massive manhunt ensued that ended with one suspect, Tamerlan Tsarnaev dead, and his brother, 19-year-old Dzhokhar Tsarnaev finally in custody after he was found hiding at the bottom of a covered boat in the backyard of a Watertown, Mass., home.